or sometimes the hands and ears. or to improve general health. Our experienced tutor will give you a grounding in Reflexology, so that all of the basics are covered. > Instruction in Practical Work - how to give a treatment – hand holds – streamlining movements – understanding reflex points. > The History of Reflexology - the origins; how reflexology came to the UK. > Contra indications and their implications - what conditions to be aware of. > Situations (if any), where it is not a good idea to give Reflexology. > Listening & Communication Skills - the art of listening, proactive questions, what is not being said – role play and simulation. 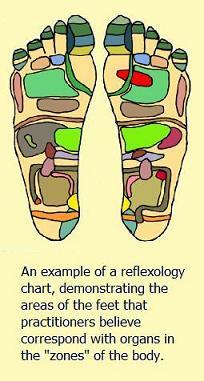 > Reflexology Charts - Knowledge and Understanding and how to identify areas of the body. Go ahead & contact us for more info !